Shawnee State avenged their January 19th road loss to Thomas More on Monday with a 72-63 home win over the Saints. PORTSMOUTH – What better way to avenge a double digit road loss just sixteen days prior than to win the rematch by nine? 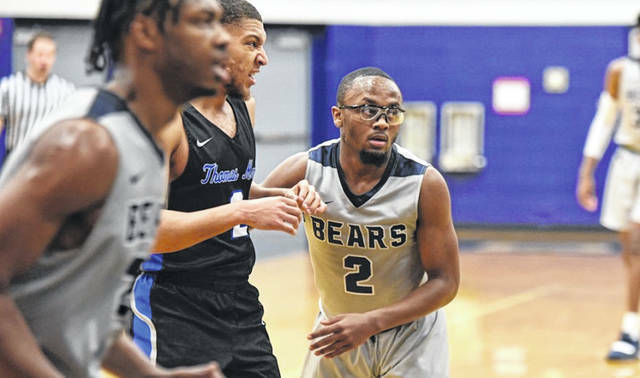 That’s exactly what the Shawnee State Bears men’s basketball team was able to do in their win over Thomas More College Monday night on their home court, 72-63. The Bears got things going early and often, jumping out to a 10-6 lead just two and a half minutes into the contest, and would never look back from there. Chris Byrd scored five of those ten points and entered halftime with a second-team high seven points, trailing only Juwan Grant who had a team high eight points at the break. Amazingly enough, SSU nearly outshot Thomas More by double in the first half. The Bears entered the locker room shooting an astounding 60.7% from the field while the Saints shot just 34.6% from the field. In the second half, the Bears lead never was less than eight points, keeping the Saints at arms’ length for the entire portion of the second half despite shooting 10/28 for 35.7% from the field during the final twenty minutes. Grant matched his first half total in the second half by scoring eight in each frame for a combined 16 points, a team high for the Bears. Chris Byrd finished with six second half points to follow Grant’s lead as he finished with 13. Sophomore big man EJ Onu also finished in double figures with 11 points. Each Bear that played, which happened to be eleven players, all scored at least two points in their win over the Saints. Prior to getting back into Mid-South play on Saturday vs. Lindsey Wilson College, Shawnee State will host Cumberland University (TN.) in the two’s first meeting of the season on Thursday. Thomas More: 22/54 FG, 7/21 3 PT, 12/16 FT.